Java is an object-oriented language designed for use in the distributed environment of the internet. By practicing the Java code that is presented in the video tutorials you will become familiar with basic Java programming techniques and will be able to write a number of simple Java programs. Java is a computer software programming language specifically designed for use in the distributed environment of the internet. Java looks similar to the C++ programming language, but it is more simple to use. This course covers key Java concepts and basic programming techniques for beginners. Learners are encouraged to reflect on the concepts and practice the Java code that is presented in the video tutorials. 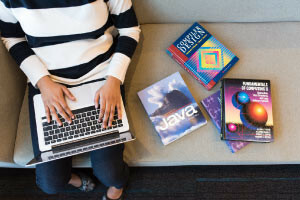 By the end of this course and following enough practice, the student will become familiar with basic Java programming techniques and will be able to write a number of simple Java programs. Fundamental concepts in Java are discussed in this course. In every programming language, certain rules must be followed. Java is an object-oriented language and involves objects and classes. Each time a new object is created, at least one constructor will be invoked. An important rule is that constructors should have the same name as the class. When Java code is written in Eclipse, suggestions automatically appear, helping the user to write the code. Keywords used in the code, such as: public, static and void are explained in relation to the function of programs. Defining variables in Java programs is also demonstrated. Variables store data that programs can manipulate. Different variable types have different capacities for size, layout and the range of values that can be stored in memory. While loops and If statements are demonstrated. A while loop in Java, is something that repeatedly executes a target statement, as long as a given condition is true. This course will be of great interest to all learners who want to learn the key concepts Java and practice basic Java programming techniques.